To the sound of a thousand wailing Palm Pilots, Palm has unveiled a version of the classic Treo smartphone running on Windows Mobile 5.0. 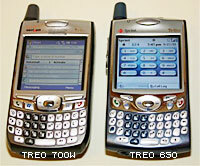 Possibly called the Treo 700w (or maybe the Treo 670 – details are scarce! ), the new phone will initially only be available from Verizon Wireless, running on the carrier’s EV-DO broadband network. A series of ‘first look’ photos on Engadget shows the new Treo to be slightly narrower than the Treo 650, but at the cost of what looks like a smaller 240×240 pixel display, instead of the usual 320×320. Confirmed specs include Windows Mobile 5.0, a one megapixel camera, EV-DO, Bluetooth and 64MB of memory. Palm users still waiting for the Wi-Fi card categorically promised at the Treo 650 UK launch in April will be mightily miffed to learn that a SD Wi-Fi card worked straight out of the box with the Windows Treo – a classic example perhaps of why people are leaving the Palm OS. 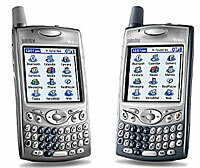 Formerly bitter rivals, Palm and Microsoft’s collaboration looks to add the security and functionality of Microsoft’s new Window Mobile 5.0 OS to the solid and well-respected Palm Treo 600/650 range. Already, pundits are suggesting that the introduction of the Windows Treo marks the end of the Palm OS Platform, still reeling from the withdrawal of the technically groundbreaking Sony Clie range. Carmi Levy, Senior Research Analyst at Info-Tech Research Group commented that the new Treo signals a massive shift in the handheld/smartphone market, adding that “when viewed in conjunction with the sale of PalmSource earlier this month, it’s an acceleration in the demise of the Palm OS platform and final confirmation that its once-dominant position in the broader handheld market is gone for good. “As popular as Palm has traditionally been with end-users, it has always been a marginal corporate player,” continued Levy. The Palm OS has traditionally lacked robust corporate security features, making the Windows Mobile platform more attractive to corporate IT departments. What Microsoft has lacked, however, is a killer piece of hardware, something they’re likely to now have with a Windows Mobile-based Treo. There’s been no release date set for the Windows-based Treo yet, but it is expected to be available “very early” in 2006. 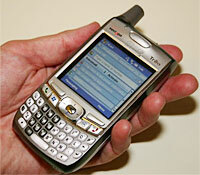 Palm plans to bring the Windows Treo to other wireless carriers in the second half of 2006, including GSM/GPRS carriers in Europe and Asia.